Radish Salad is a staple on the Russian summer table. I grew up with a very large vegetable garden, filled with plenty of radishes, cucumbers, onions, plus every other vegetable imaginable. As a result, there were always 2 salads that we always ate in the summertime, this Radish Salad and a delicious rustic Tomato Cucumber Salad. 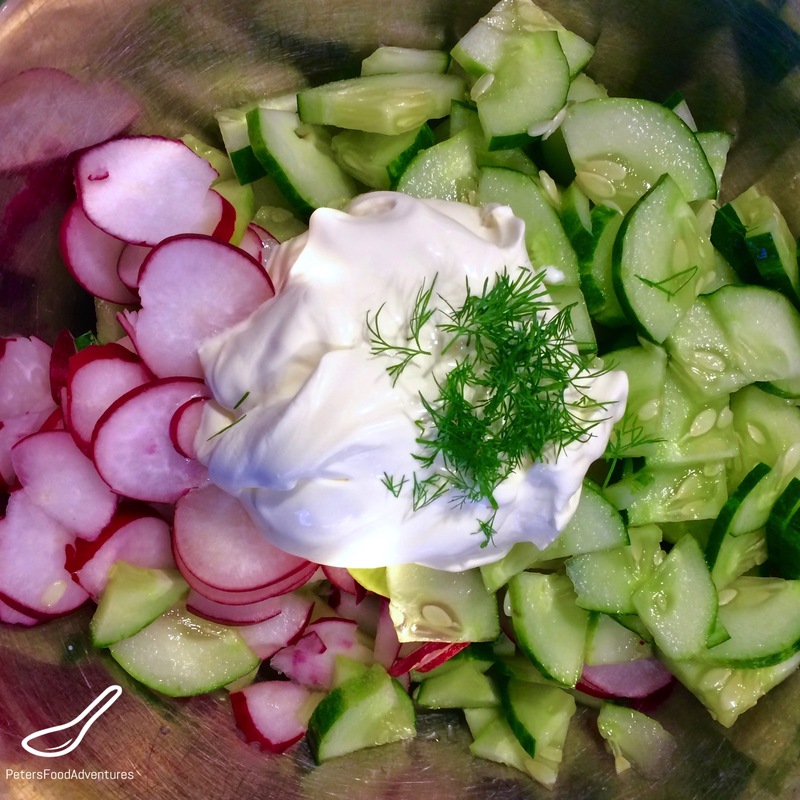 If you dislike the sometimes sharp flavour of radishes, the sour cream will mellow out the sharpness in this salad. This salad tastes best with sour cream, but if you are worried about the fat content, you can substitute with Greek Yogurt. Radishes aren’t that popular in western cuisine, and I don’t know why? They’re very healthy for you. Perhaps people just haven’t found a tasty way of eating them? I love growing radishes. They grow very fast in the garden, you can get several crops across the summer, and are an easy organic crop to grow with so many varieties. Plus they are high in vitamin C, folate and the B vitamins, all good for you. 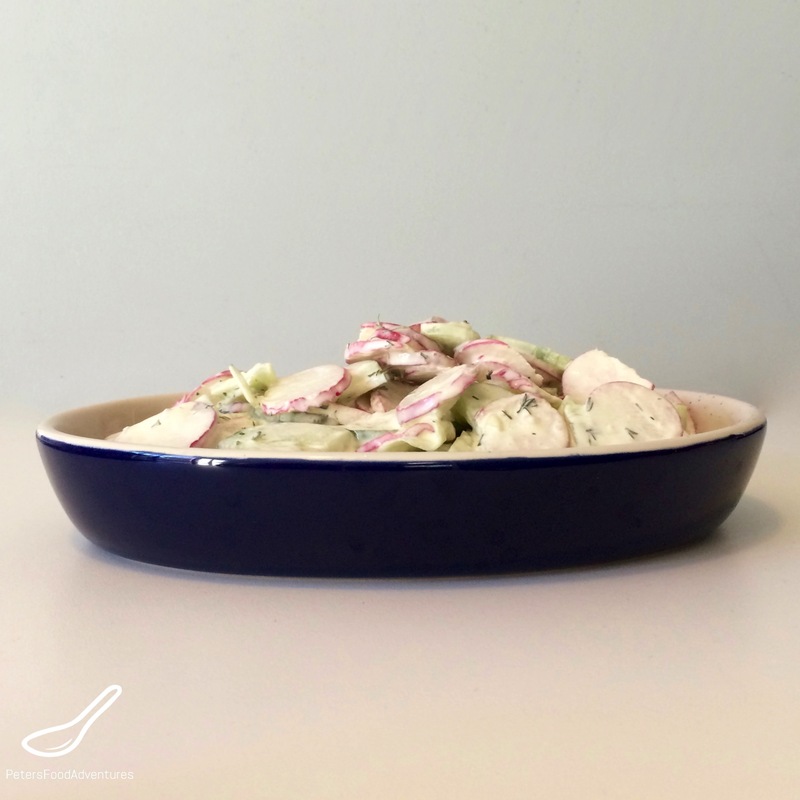 So enough of the gardening lesson, this is a super easy salad to throw together in a few minutes, full of vitamins, and so very Russian with the sour cream and dill. Bon Appetit! Приятного аппетита! Slice the cucumbers and radishes and put in a medium sized bowl. Add the sour cream and chopped dill to the cucumbers and mix until completely coated. *NOTE: You can prep the salad in advance, as long as you don't add the salt and Sour Cream until you're ready to serve. You can substitute Greek Yogurt instead of the Sour Cream. I have not seen this in such a long time! Oh I am so glad I came across this. I love radishes, and always have a ton to use up from my garden I usually do hot recipes, soups, mashed, etc but never thinking of a salad like this. This will fit perfectly into my low carb diet and the colors will look so nice plated together..Thank you!!!! Thanks for checking it out! You’re right, it’s perfect for a low carb diet, and healthy too! ??? ?